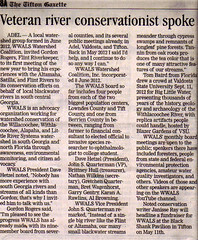 This entry was posted in PR and tagged Al Browning, Alapaha, Bret Wagenhorst, Brittney Hull, conservation, Dave Hetzel, Garry Gentry, Georgia, Gretchen Quarterman, John S. Quarterman, Karan A. Rawlins, Little, Lowndes County, Nathan Wilkins, north Florida, PR, President, river, Secretary, south Georgia, Tifton, Tifton Gazette, Treasurer, VP, watershed, Willacoochee, Withlacoochee, WWALS, WWALS Watershed Coalition on January 18, 2013 by jsq. Adel, GA, 9 January 2013 — A local watershed group formed in June 2012, WWALS Watershed Coalition, invited Gordon Rogers, Flint Riverkeeper, to its first meeting of the new year to bring his experiences with the Altamaha, Satilla, and Flint Rivers to its conservation efforts on behalf of local blackwater rivers in south central Georgia. 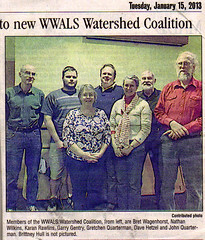 This entry was posted in PR and tagged 9 January 2013, Al Browning, Alapaha, Bret Wagenhorst, Brittney Hull, conservation, Dave Hetzel, Garry Gentry, Georgia, Gordon Rogers, Gretchen Quarterman, Janisse Ray, John S. Quarterman, Karan A. Rawlins, Little, Lowndes County, Nathan Wilkins, north Florida, PR, President, river, Secretary, south Georgia, Treasurer, VP, watershed, Willacoochee, Withlacoochee, WWALS, WWALS Watershed Coalition on January 10, 2013 by jsq. 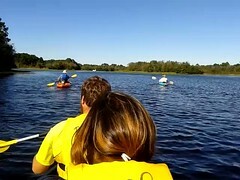 WWALS had a brief canoe and kayak outing at Reed Bingham State Park Sunday, led by Bret Wagenhorst. Heading out, and some coppices of native trees. 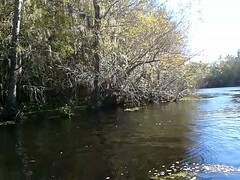 This entry was posted in Outing and tagged 21 October 2012, Al Browning, Alapaha, Bret Wagenhorst, Brittney Hull, canoe, conservation, coppice, Dave Hetzel, Garry Gentry, gator, Georgia, Gretchen Quarterman, heron, hydrilla, invasive species, John S. Quarterman, Karan A. Rawlins, kayak, Little, Lowndes County, Nathan Wilkins, north Florida, Ogeechee lime, Outing, President, river, Secretary, south Georgia, Treasurer, turtle, VP, watershed, Willacoochee, Withlacoochee, WWALS, WWALS Watershed Coalition on October 22, 2012 by jsq. 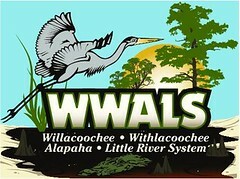 Here are videos of Tom Baird’s talk for WWALS hosted at VSU by Blazer Gardens, about the Y-shaped Withlacoochee, or Suwannee, or Swithlacoochee, from the dry Paleo-Indian era 14,000 or more years ago through atlatls in the woodland period and Troupville queen city through the Ellaville log boom to current-day over-pumping of the aquifer. 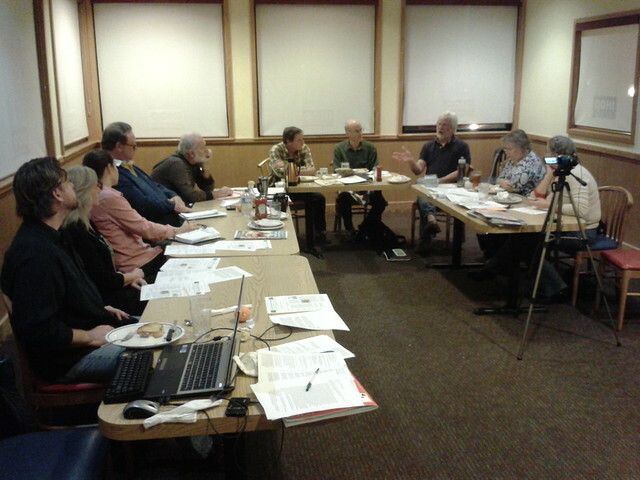 This entry was posted in Conference, Outing, River and tagged 11 September 2012, Al Browning, archaeology, artifacts, Ben Vieth, Big Little Water, Blazer Gardens, Bret Wagenhorst, Brittney Hull, conservation, Dave Hetzel, Garry Gentry, geology, Georgia, Gretchen Quarterman, history, John S. Quarterman, Karan A. Rawlins, Little, Lowndes County, Nathan Wilkins, north Florida, President, river, Secretary, south Georgia, Tom Baird, Treasurer, Valdosta, Valdosta State University, VP, VSU, watershed, Withlacoochee, Withlacoochee River, WWALS, WWALS Watershed Coalition on September 20, 2012 by jsq. 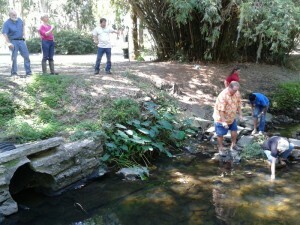 Students getting water from creek for Adopt-A-Stream water quality testing training. Angela Bray of the Southern Georgia Regional Commission (SGRC), assisted by Richard Battenn of SGRC and Al Browning, taught an Adopt-A-Stream water quality testing workshop Saturday 25 August 2012 in Valdosta. This entry was posted in Outing, Quality and tagged 25 August 2012, Adopt-A-Stream, Al Browning, Alapaha, Angela Bray, Bret Wagenhorst, Brittney Hull, conservation, Dave Hetzel, Garry Gentry, Georgia, Gretchen Quarterman, John S. Quarterman, Karan A. Rawlins, Little, Lowndes County, Nathan Wilkins, north Florida, President, quality, Richard Batten, river, Secretary, south Georgia, testing, training, Treasurer, Valdosta, VP, water, watershed, Willacoochee, Withlacoochee, WWALS, WWALS Watershed Coalition on August 26, 2012 by jsq.